It is really difficult to make something you have never tasted or seen. I have no idea what whoopie pies taste like, and I have only ever seen them on one blog. So when this month’s daring bakers’ challenge was for whoopie pies, I turned to my copy of Miss Melicious Cupcakes for help. I adapted the recipe on page 71 for the chocolate whoopie pies but decided to make a filling using my salted caramel as Dave has not stopped raving about it since I made my ice cream. I had a visitor for dinner the night I made these and so they were served as dessert. They went down a treat and I am sure that they will make a perfect dessert for any occasion. If I were to host a tea party, these chocolate whoopie pies with a salted caramel filling would definitely make an appearance. The chocolate taste was really enhanced by the salted caramel. Your whoopie pies look way better than the real thing…your whipped cream salted caramel filling sounds wonderful. Whoopie pies are a favorite from growing up, I can never say no to one! yum! it’s looks totally delicious Tandy, great job! 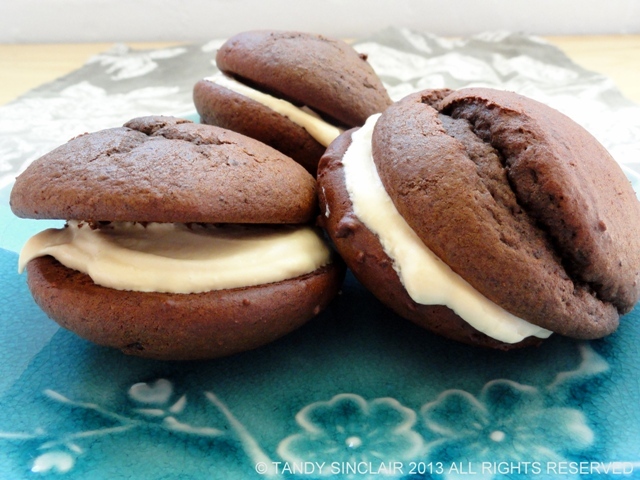 I love good whoopie pie and these look delish — especially with the caramel sauce! Belated Happy Christmas Tandy and wishing you all the best for 2014. Sorry my comments haven’t been as regular but always love reading about your baking and cooking exploits. Wishing you a brilliant 2014 as well Sally! Lol! I know what you mean… I made Red Velvet Whoopie Pie without ever having tried a “real one”. This recipe sounds awesome… YUM Salted Caramel, yes please!! These little whoopie pies sound sinful. Wishing you a super new year! I know exactly what you mean! I love to try recipes from around the world, but often I can only judge “do I like this?” and nothing about the authenticity. That looks delicious Tandy! I’ve had Whoopie Pies a few times and they’re kind of like a cross between a cake and a cookie or really more a muffin top sandwiched together. The salted caramel filling sounds divine! Oh Tandy, these look absolutely scrumptious and very temtpting! Love the salted caramel filling. Chocolate, salt and caramel all together might cause instant death from happiness–and be totally worth it!!! I love a good whoopie pie, but this filling makes these WAY better than the average one! After Christmas I am so full, but I can totally eat this. I love anything that includes salted caramel and these look delicious! These definitely look like whoopie pies to me!! I love the filling. Thank you Joanne, I am so glad to hear that I got them right! The recipe works perfect for the Slurrpy challenge also! Love those flavors together.